This idea of a company town was not new. It was a common practice among mining companies to establish these towns to minimize payout to employees. With upcharges for everything, a miner’s take-home check diminished to the point of nonexistence, and at times a miner could owe debts to their companies. Some executives established company towns to maximize profits. But Pullman’s idea was radical. Outside the lure of a frenetic Chicago, a town of peace, order, and prosperity would exist on the foundation of labor rights. According to Pullman, a company-owned town could be good for workers because the company controls the value of goods. And since the company also determines paychecks, the worker, in theory, would require less compensation for a high-quality life. The reasons for the Pullman Strike were many: Pullman disallowed any employee from buying or renting a house outside the company town; he had a “paternalistic” governing style, forbidding any democratic initiatives from influencing governance; and, as profits and paychecks declined correspondingly with the demand for Pullman cars, rent rates remained unmoved. 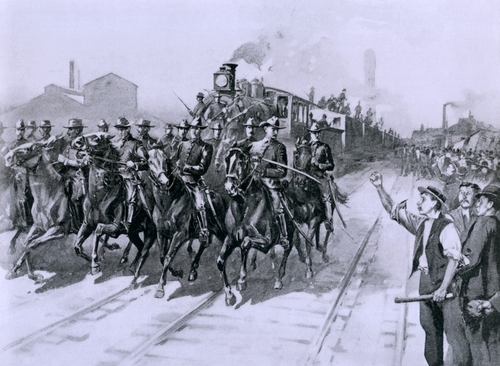 When the Pullman Strike ends, the ARU disbands, Debs finds himself in prison for six months, and Pullman employees sign pledges vowing they’d never unionize again. The outfall stultified union growth and development across the nation until the Great Depression.